(CNN) - Every now and then, Logan Smith likes to search Twitter for things he thinks people would never say. Just for his entertainment. Like when astronaut Neil Armstrong died, Smith typed in: "Who is Neil Armstrong?" Who in America doesn't know about the man to who took a giant leap for mankind? Sure enough, he found, there were a bunch of folks who had no idea. In the midst of all his searches, Smith made a startling discovery: a lot of people like to start tweets with this line: "I'm not a racist, but..."
What followed seemed clearly racist to Smith, a 25-year-old white man from Columbia, South Carolina, who writes a politics and policy blog called The Palmetto Public Record. Smith was shocked. Dismayed by what he read. "It's ridiculous to think that people don't think they are racist when they say these things," he says. "Some people say we are living in a post-racial society. Now we have a black president, somehow that made everything OK. But that is completely not the case." So Smith decided to call some tweeps out. 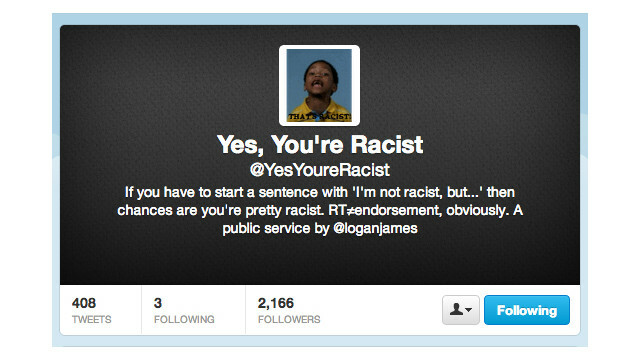 About a month ago, he started a Twitter handle called @YesYoureRacist. The avatar gif mouthing the words "That's racist!" came from the show "Wonder Showzen," which used to air on MTV2. He picks a tweet that says "I'm not a racist, but..." then retweets it with a simple reply: Yes, you are. He directs his responses to any tweets he finds offensive. They mention dislike of white people, black people, foreigners and people of different ethnicities. Some use derogatory language and names, or worse. If Smith gets a response, it usually starts with a four-letter word. More often than not, there is no conversation. Sometimes, they respond like Twitter user @J_woww16, who originally tweeted, "im not racist but i never liked the idea of having a black president #awkward"
She disagreed with Smith's statement that she's a racist - she said not liking a black man as president was a matter of opinion, not racism.
.@j_woww16 Saying you don't like having a black president simply because of the color of his skin is an inherently racist statement. It's rare, though, for Smith to respond. Usually, he lets other people challenge them. Smith says he set up a search for "I'm not a racist" to find the tweets. He can find enough in one day to last him for a week, a fact that he finds rather disturbing. He also tries to sort through them, weeding out tweets he thinks are intended as irony versus those he plain finds offensive. "I am depressed for humanity," he says, "but I have kind of learned that society is what it is and hopefully, publicizing some of the awful things people say on Twitter will help bring about a change." The racism the flows through this country is fallacy that there is no individuality among non-white ppl. The behavior of some equals the behavior of all. It doesn't make you a racist to not like a person of color. It makes you a racist to decide that because some ppl do one thing, that all the people in that race/ethnicity also do that. The majority of serial killers are white. But how stupid would it be to say that all white ppl are serial killers? Or that white ppl are somehow predisposed to mass murder? Or maybe we should use how white ppl are portrayed on TV as the standard for the race? Based on many of the popular TV shows it would seem that there is a large percentage of uneducated hillbillies in the white races. If you have any sense at all you realize that these are individual stories that don't represent anyone but the people being featured. And for those ppl who say Obama was elected because of all the blacks who voted for him: there aren't enough black ppl in this country to make that happen. Maybe you assume that ppl are voting because of race, because YOU are voting because of race. I think it's more likely that ppl voted for the Democrat that was running for president. I voted for the Democrat because when George W. (the Republican president) left office, our country was on the very of another Great Depression. That Republican president took the economic surplus that Bill Clinton (the Democrat president) left and flushed it down the toilet. Seems like ppl forgot about that. It takes more than 4 years to undo the damage done by George W. Especially when the Republicans in Congress oppose every thing the President tries to accomplish. I won't vote for a party that puts the citizens of this country in the backseat. George W. screwed this country. He screwed Texas when he was the governor. This election (and the last election) the Republicans didn't come the table with anything new. And we've seen what happens to this country under their leadership. The "voodoo economics" of Reagan/Bush that made thousands of working class people (of all races) homeless. Homelessness was not something that happened to families with jobs. A recent study found that TODAY in Texas that a shocking number of ppl are only one job loss away from homelessness. Our state has truly suffered under the Republican rule. So maybe instead of assuming the ppl voted for Obama because he's black, you realize many people are voting for Obama because he's not a Republican. I think it's absolutely true that a lot of people hide their "racism" by making convenient excuses to not like Obama, but when it comes right down to it, their bias is based on the fact that they think he is not white (or white enough). Anyone annoyed by people thinking they are the moral authority, i.e. this Logan Smith fool? No. I'm annoyed that you would defend racists and attack the person who is lifting the rock to identify racists. I'm not racist BUT, many black (and white) folks in the U.S. don't behave ANYTHING like the folks of their race, heritage and ethnicity overseas. As a matter of fact, most U.S. Americans can't hold a candle to their European, Afrocaribbean, IberoAmerican or Asian counterparts as far as social and cultural education, tolerance and personal hardiness. I think that you are right. I have traveled to several countries overseas and I have found that Americans (Black, White, Brown, etc) have a unique standard of racism. It is in this culture. We, as Americans are to blame. I am a 62-yr-old African-American woman. Ever been to south Africa? They dont care much for blacks. Being called a racist has lost its meaning. The ones usually calling people racists are too dim to make a counter-argument. Amen! Racist is becoming a word that I am proud of. I was already fairly pleased at just being called a bigot. Good for you. Deep down I think we are all racists to certain degree. How can we not be? We are not color blind and we can distinguish color or race different than us. It is how much we understand where to draw the line. I wish I have more black friends or even a black spouse but I am not black. So I am a racist but I am no problem of having a black president. I want to have black friends. I think it is good to have someone different from me. II am not a racist, but.... I get accused of it every time I disagree with a person of color who is loudly advocating Obama. The fact that I am a registered libertarian, dislike his voting record as a junior senator – especially his co authoring the fanny mae and freddie mac legislation that helped land us in the financial mess we are in, and other relevant facts blithely fly over the heads of these bigots who believe skin color is somehow relevant as a qualifier for high political office. Sorry to go off tangent. But to further the example of the tweeter who started this mess, Yes James you are a racist. if you wish you had more friends of any color, you are racist. Any judging of a man strictly for their skin color is inherently racist. i do not wish I had more black friends, or more white friends. I wish I had more good friends. Psstt... Hey... Don't let this get out ok? There really are black libertarians. And we're really not racists. When the ONLY reason you don't like someone, is their color of their skin, then you're a racists. Obama had very little to do with the financial mess we are in, here in the U.S.
Jane, that was *awesome* – perfectly well said!! If people would look up the definitions of "racist" and "bigot", racism would just about disappear. I'm not a racist but I think Tyler Perry's film work is garbage. All of it. Please revoke his video making rights. I agree 100%. I am black. I am a progressive liberal. His stuff is terrible. It is typically patronizing to blacks and cliche filled as well as stereotype filled dribble. Like others have said, if you start a sentence with "I'm not a racist, but ...", what you are about to say is racist. When my mom was alive, she would tell me about the doings of the neighbors when I came to visit (usually prefaced with "I don't mean to be a gossip, but ..."). Her neighborhood was truly diverse–black families, white families, Hispanic families and so on. Her favorite target was a family across the street, who I admit got a bit rowdy on occasion. She would tell me the latest story. Then she would lean in close and say: "Well, you know they're ... (voice drops to one of those whispers the whole room can hear) black." I would call her on it. After all, she and my dad had been known to have parties on the rowdy side now and then, and we were about as white as white can get. She'd shake her head and insist: "I'm not racist!" So, what pray tell does being black (or any other color) have to do with having a rowdy party? Again, she'd shake her head and tell me I just didn't understand. She was right. I didn't understand, and I still don't. "In your opinion I am a racist. You are just saying that because I am white. Anti-racist is a code word for anti-white." lol! Keep telling yourself that. Maybe if you repeat it enough times you will believe it is true. Thanks for that, I needed a good laugh. Never say "i'm not a racist, but.." Do like I do "I am a racist and..."
You have a right to be racist (not that I agree with you). At least you're honest. Most deny it but act it out. Isn't it rather assuming to suggest that most racists hide their racism? If they are true racists and are hiding it, how would you know? By assuming the worst? Face it; it's just easier to assume that ALL white people are racists (even the huge number who vote for Obama). That's the simple-minded fact of the matter. And unfortunately many choose this course for hating white people. Why? Because it's SO easy. Not because of fact. I think he is doing us all a service. It's time to call out the closet, anonymous racists, bigots. They are all cowards. They are all ignorant by choice. They may have learned their ideas/beliefs on dad's knee, but as adults they have had opportunity after opportunity to see how stupid and self-defeating their beliefs are and to change. When I read comments like 'john', who actually states that his views and wants are being oppressed because he is white I want to gag. His wants are being deprived because he and his fellow travelers are violent, active and completely unpatriotic criminals. retphxfire, I totally agree! Using that same logic, that as adults we are completely responisble for our actions, we should tell the folks who were brought up poor that it is all their fault that they are now unemployed, underemployed and likely uneducated. yeah, and having an idea totally makes someone a criminal. y'a know what? lets put all of the people who have ever criticized a president in prison, because that idea is "bad" too. Logan's racist if he proposes or supports laws and policies that would deprive the white race of its self-determination, free from the interference of other races, forcefully bonding other races to ours through a despotic federal government. If he's for depriving whites from the requirements necessary for white survival, including territorial exclusivity, he's a racist preaching racial genocide. You're racist if you propose or support laws and policies that would deprive the black race of its self-determination, free from the interference of other races, forcefully bonding other races to ours through a despotic federal government. If you're for depriving blacks from the requirements necessary for black survival, including territorial exclusivity, you're a racist preaching racial genocide. John, if you want territorial exclusivity for whites you should probably try Siberia. There is already infrastructure in place and the residents are mostly white. If that isn't good enough, because of those pesky pesky asian genes that find their way into the great white blood you could always inhabit an island off of Antarctica. The water is fresh, the sunshine bright, and best of all NO ONE LIVES THERE! You can start your own white nation. I wish you the best of luck, I mean being as the world really isn't that big and all. Sooner or later you'll have to either deal with those darned non-whites or hope that someday people can explore the stars and maybe find you and others like you your very own White World! Oh wouldn't that be grand? I know everyone else on the planet who is tired of such vitriol as yours would be glad that you were gone. Yes John, I support every law on the books, that denies you the dubious "right" to impregnate your mother, sister, or daughter. What you see as "pure", the rest of the world sees as you p!ssing in the gene pool of what might one day be decent people. I perfer dealing with a someone who I know is a racist. Minitories feel they are accept until someone makes a comment that you know is racist, so why did you not see that before, YOU WERE NOT LOOKING. They were free to do this all their lives, get with the program. Now you are call on if you do that, even by whites, so it is not a popular as it was when we did not work, sleep, etc. together. AND IT IS TAUGHT IN THE HOME. Yes the sickness is a learned behavior. Agree. My dad was career Navy, we lived in the south, mid-west, east and west. I found more racists in mid-America than in the south, but if you were a minority they hid it well until they burned a cross on your lawn in the middle of the night. I am white, so they didn't hide any of their true feelings and activities. When in the south, it was ugly, but at least the bigots were obvious and you knew to stand clear.